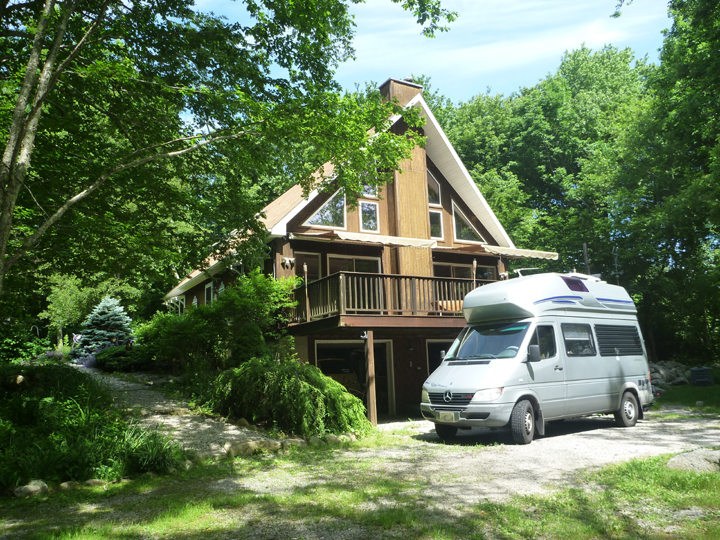 We got to our home in Rhode Island a couple of days ago after driving some 45,000 miles over the course of 2 years and 8 months…whew. Even I can’t believe what we did! Now it’s time to wrap up the final reporting on our adventure. 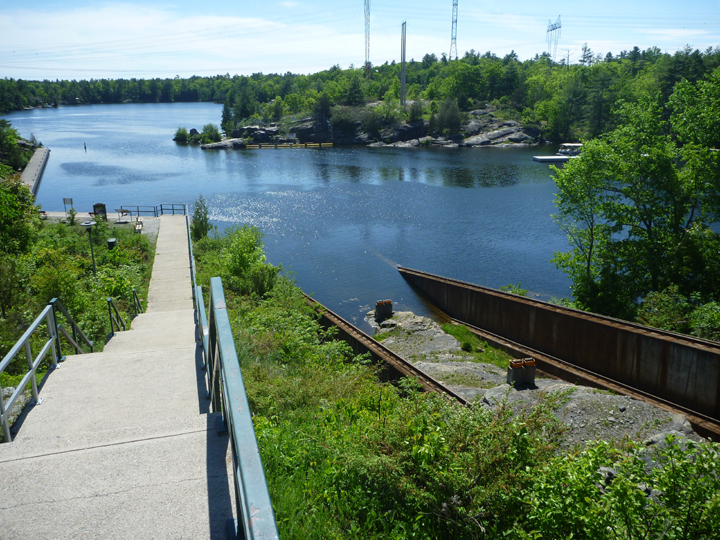 In my previous post we had just crossed over the border into Canada along the north shore of Lake Superior. After our morning tour of Fort William we were back on the road. 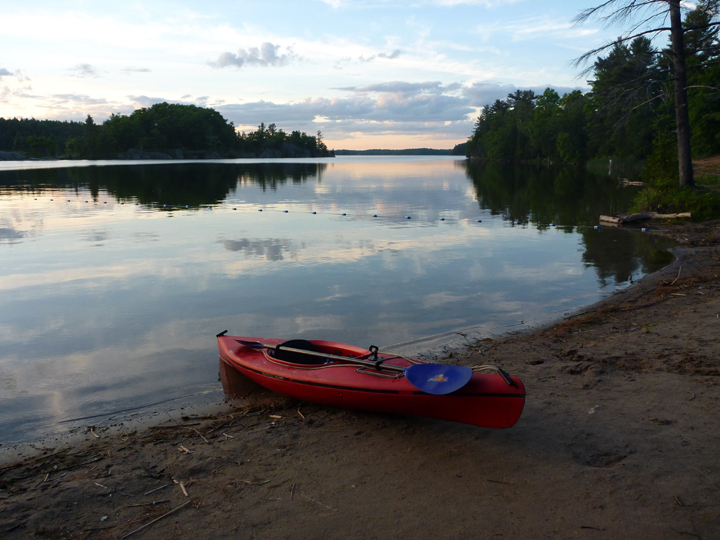 Thanks to generous Boondockers Welcome hosts, we camped overnight near the shore of Whitesand Lake near Schreiber, Ontario. The sun finally came out for our last afternoon and evening on Lake Superior while we were camped at Pancake Bay Provincial Park. Got the bikes out for a little ride and took a couple short walks on the beach. 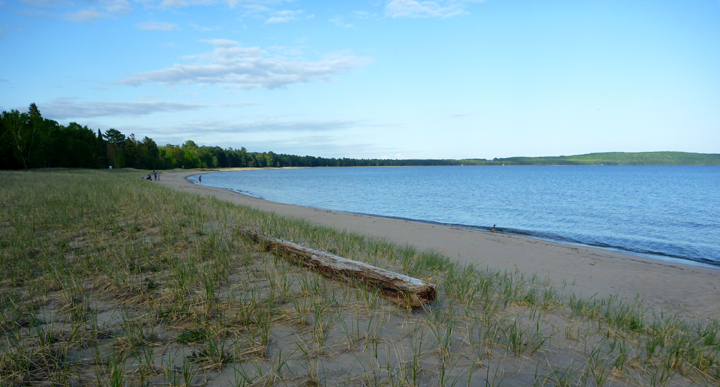 3 kilometer sandy beach on Lake Superior at Pancake Bay Provincial Park. Lunch stop at Bruce Mines harbor on Lake Huron. We were lucky enough to find several Boonodockers Welcome hosts on this portion of our trip home. We thank them all for generously allowing us to stay on their property. We hope to host some boondockers at our home this summer…come on down! 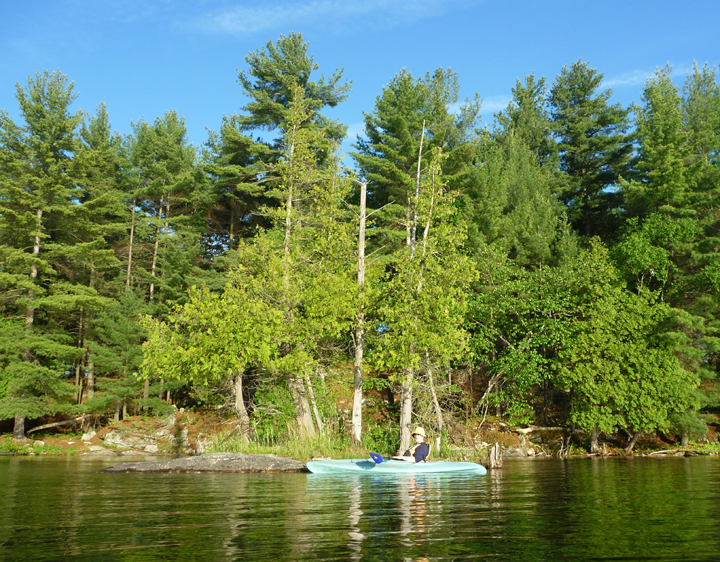 Our next overnight boondock was with Doug near Sudbury, Ontario. We spent a couple of hours together pouring over maps and telling traveling tales. 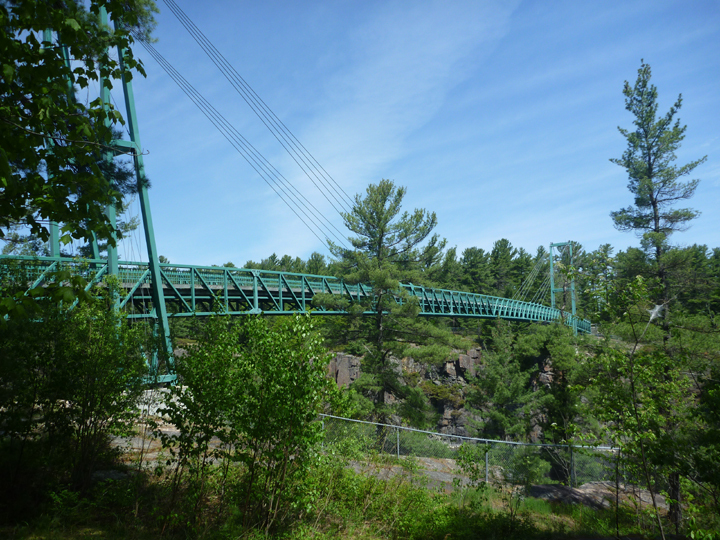 Snowmobile suspension bridge over French River. The largest of its kind in the world. 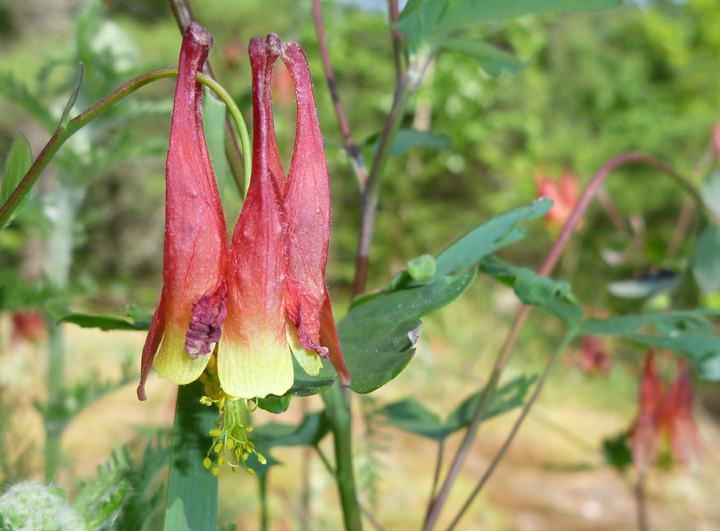 Wild Columbine – love it. Another picturesque lunch stop. 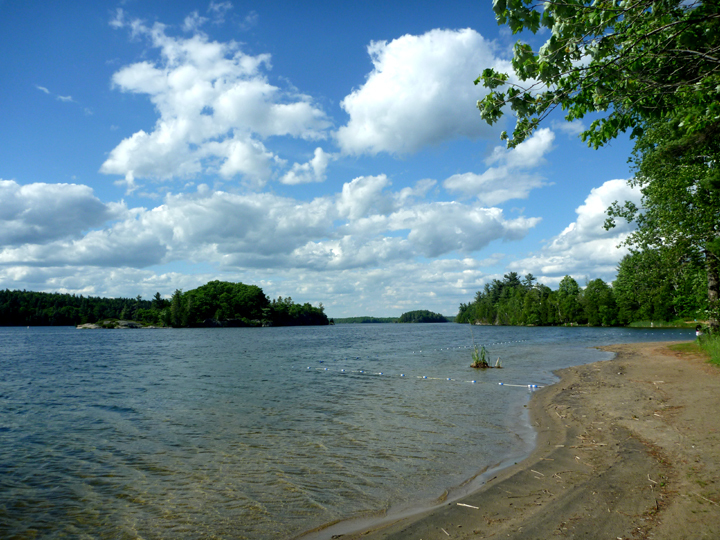 This one at Sturgeon Bay Provincial Park. 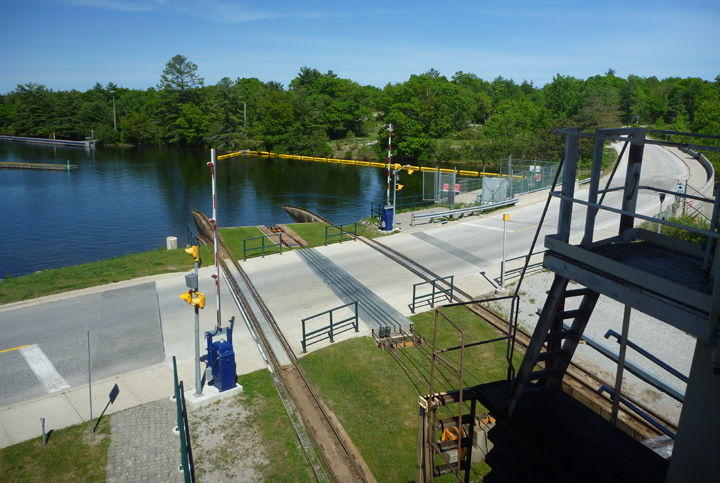 The “Big Chute” Marine Railway, Lock 44 on the 386 kilometer Trent-Severn Waterway. 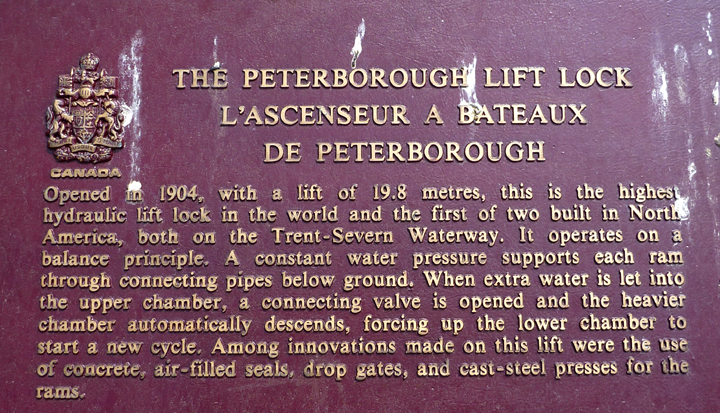 The only lock of its kind in North America. The carriage picks up boats here. And carries them down this hill. To this lake, which is 58 feet lower. 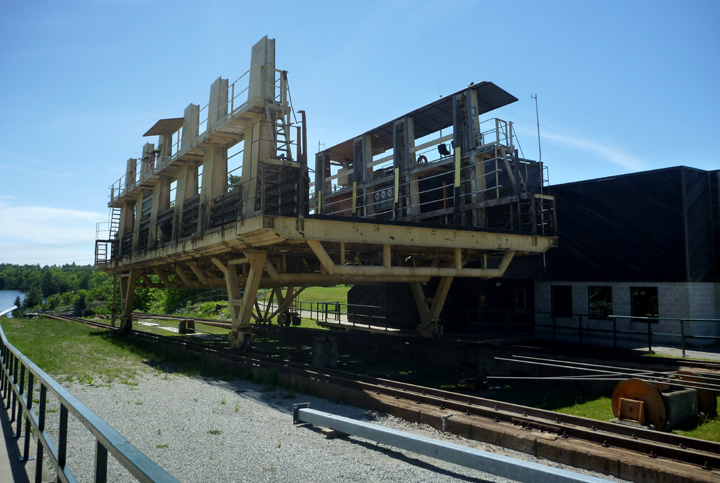 Unfortunately, we did not get to see it in action. 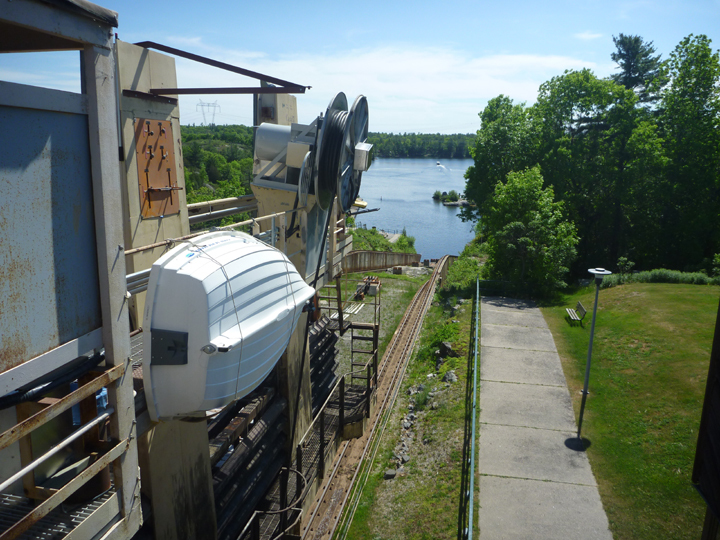 The next day we got luckier as we watched three boats ride this mammoth Lift Lock at Peterborough. 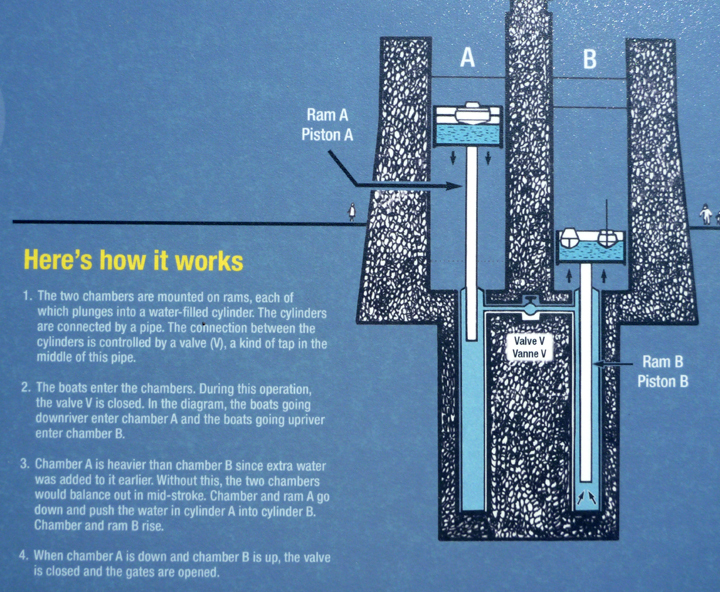 It’s pretty amazing how it uses only the weight of water to operate. 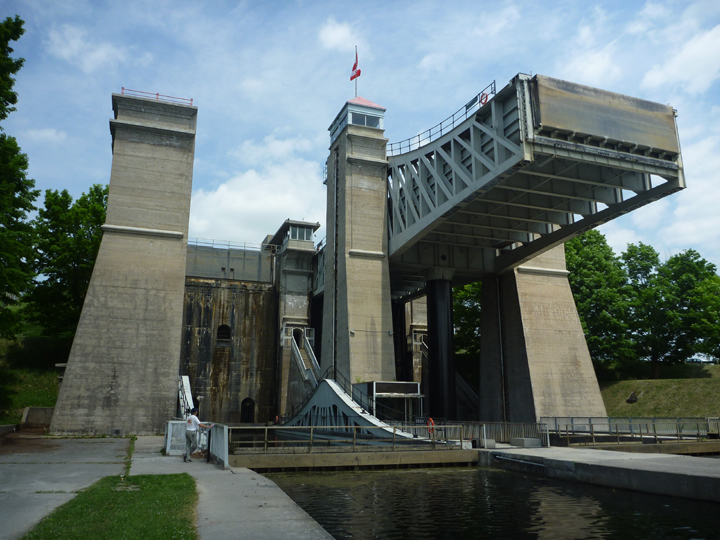 This is Lock 21 on the Trent-Severn Waterway. We’d love to boat there someday. 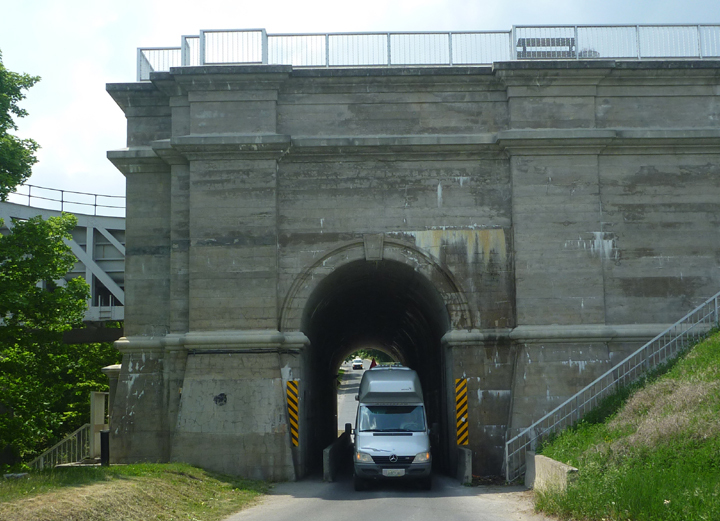 Cool tunnel next to the lock we just had to take haRVy through. 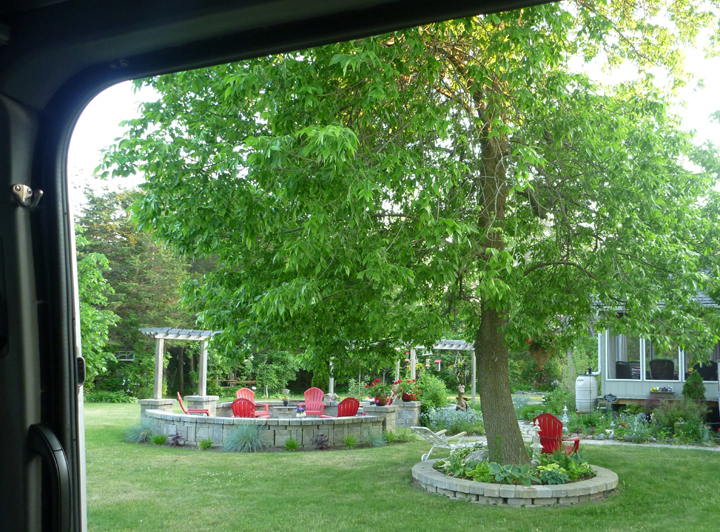 The lovely garden we camped in at the home of BW hosts Ron and Pat near Picton. 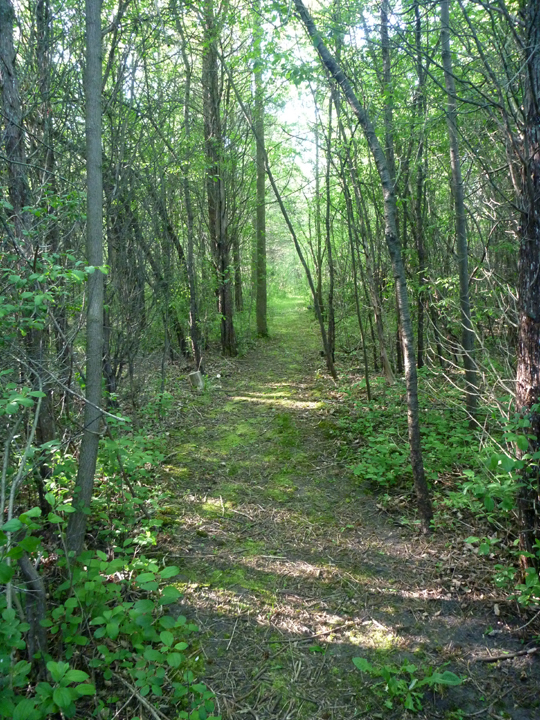 Wooded pathway to their lower 40 acres of land. 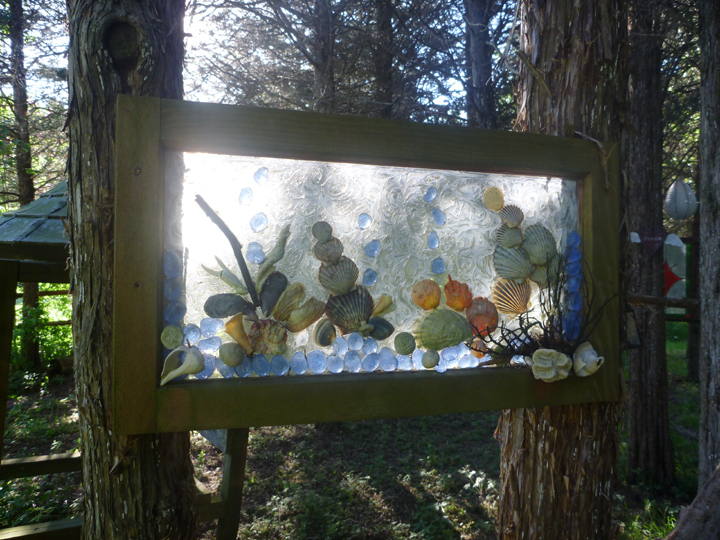 Pat’s creativity was evident throughout their property. 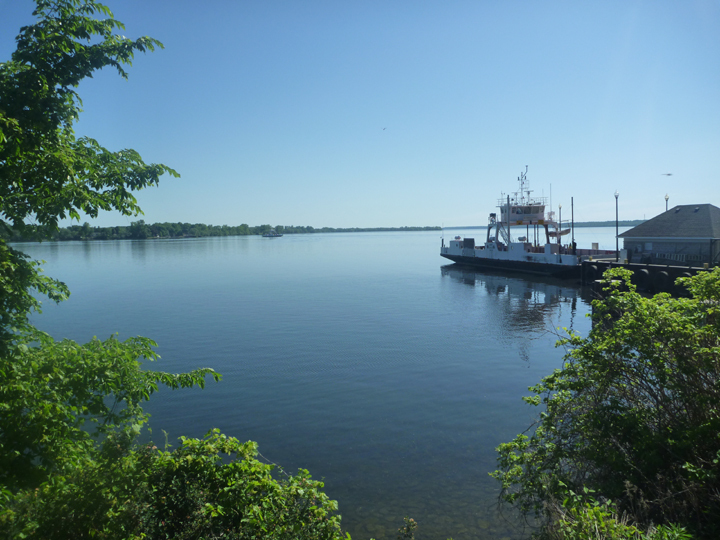 A quick 15-minute ride on the FREE Glenora Ferry took us towards Kingston, Ontario. 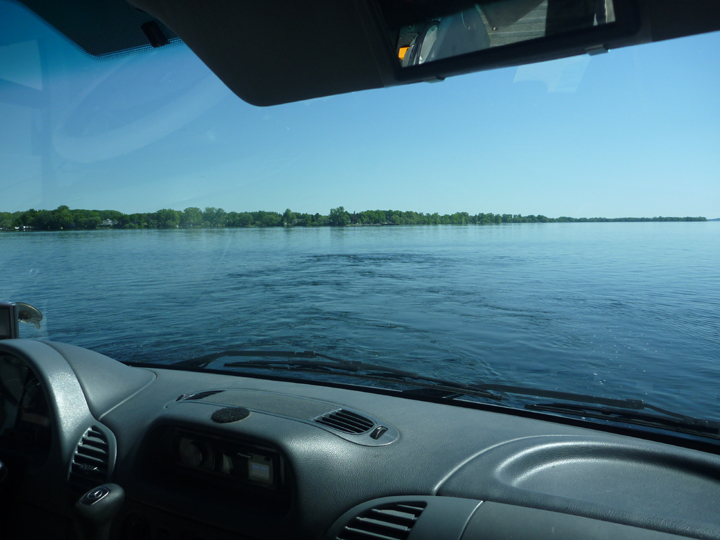 Our front row position almost felt like we were driving the boat. Lunch stop on shore of Lake Ontario. 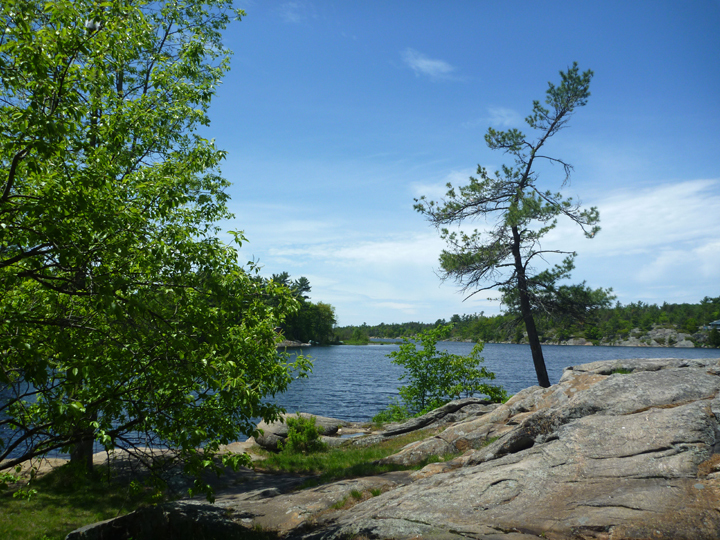 Camped near the shore of Charleston Lake north of Gananoque where we also took a look around. An enjoyable paddle after dinner. A nice pink sunset sky at the end our time on the water. Alongside highway 68 near Ogsdenburg, New York after we crossed the border back into the USA. 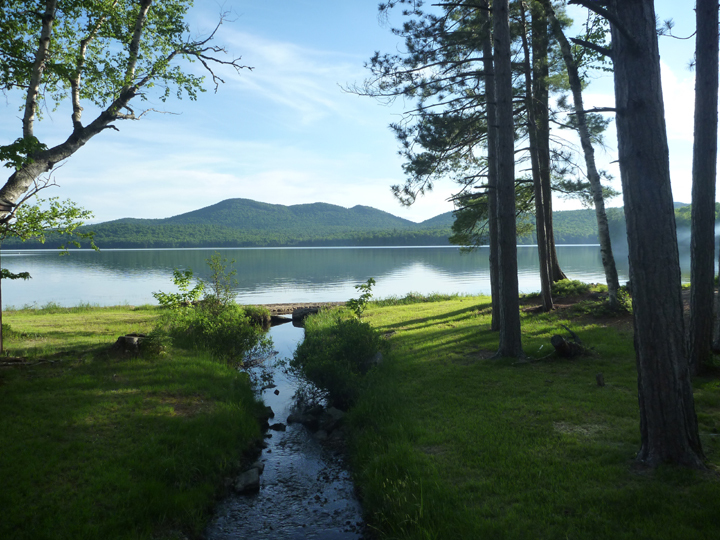 Just love the ADKs. Almost felt like home we’ve been there so often. This was our first time at Lake Eaton. Nice site just a few feet from the water. 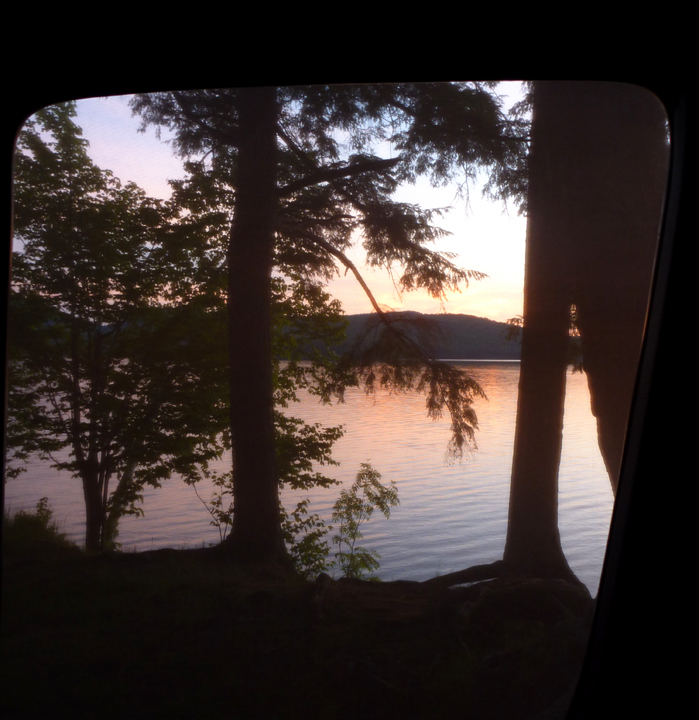 Our night onboard haRVy at Lake Eaton was supposed to be our last of this grand adventure we’ve been on for nearly three years, but Mother Nature had other ideas. Less than an hour after a delicious lunch at our favorite ADK eatery in Chestertown, the wind and rain became intense enough to make driving a bit uncomfortable. Since we had no schedule to meet, we pulled into yet another Boondockers Welcome driveway in Saratoga Springs to camp. 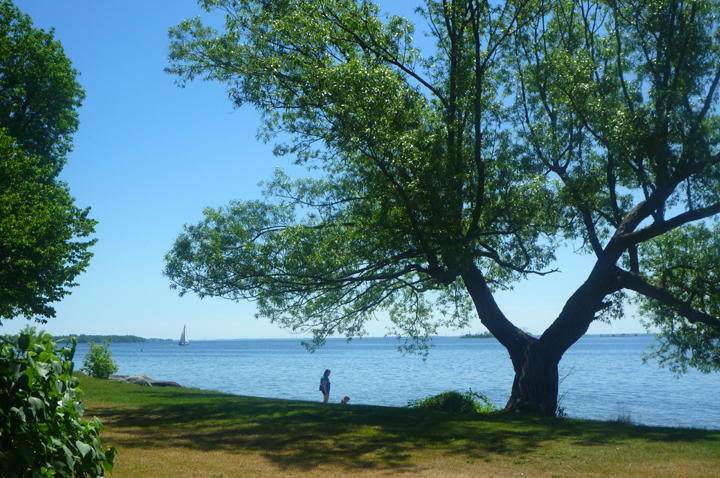 The next day was sunny and clear providing a very pleasant drive to our home in Tiverton, Rhode Island. 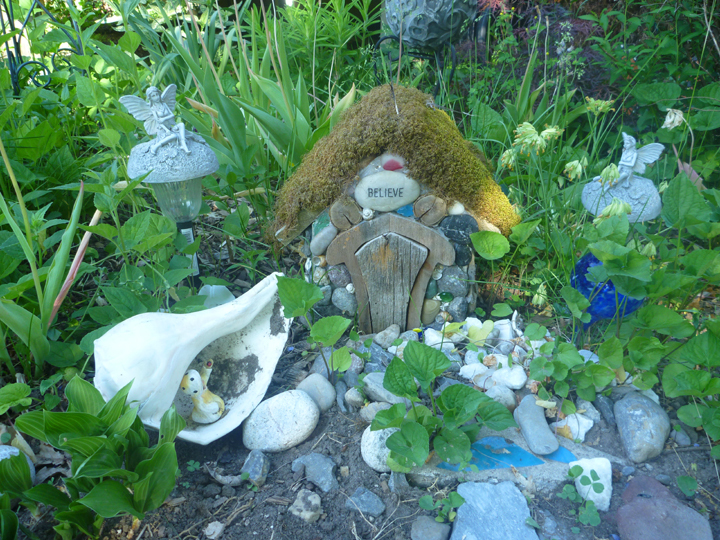 I am looking forward to taking a break from blogging, but next time haRVy is on the road I will be back! In the meantime, come visit us this summer. Y’all welcome! Sincerely, Sunny Harvy. Incredible trip, wonderful photos – thanks so much for sharing your journey. I’m going to miss your posts. Get back on the road soon so I don’t suffer withdrawal. I’m going to miss your posts and pictures. You’re our heroes/inspiration! 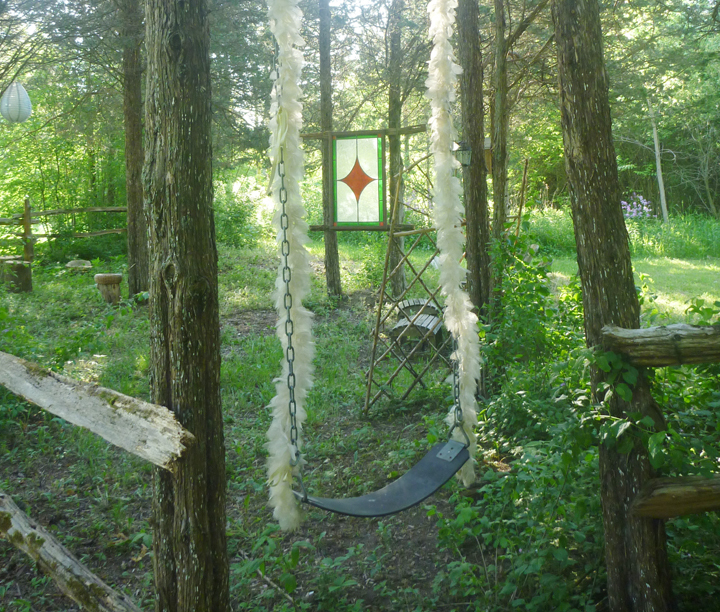 Ahhh – last blog for awhile. Feeling a bit melancholy about that! 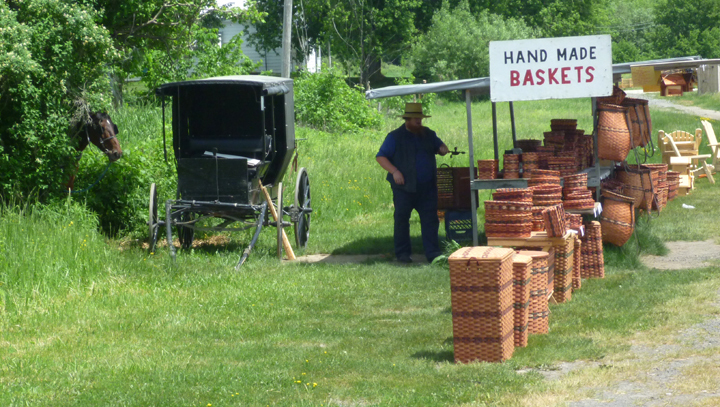 Love that wild columbine too – and those handmade baskets. Didn’t know a snowmobile suspension bridge existed! 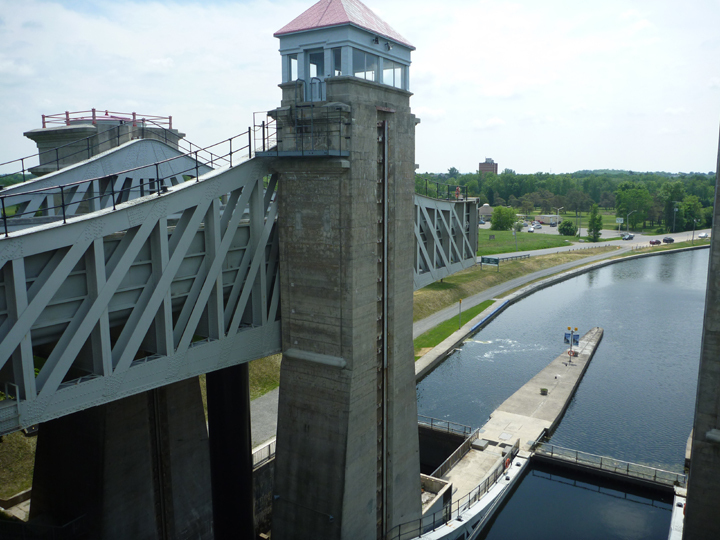 Those locks are amazing – “Big Chute” and the carriage picking up boats to carry down the hill. You have experienced so much! That you for sharing all this. I am truly inspired. I will miss the grand adventures of haRVy and crew. Gorgeous gorgeous gorgeous. What a grand last leg of your grand tour. Welcome home!!! Welcome home, that was a grand trip, congratulations. 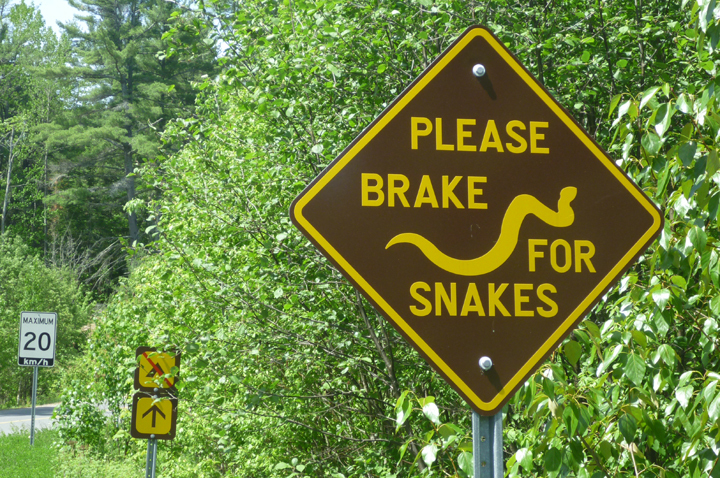 Great pictures and thanks for some ideas of where to possibly stop as we head back east. 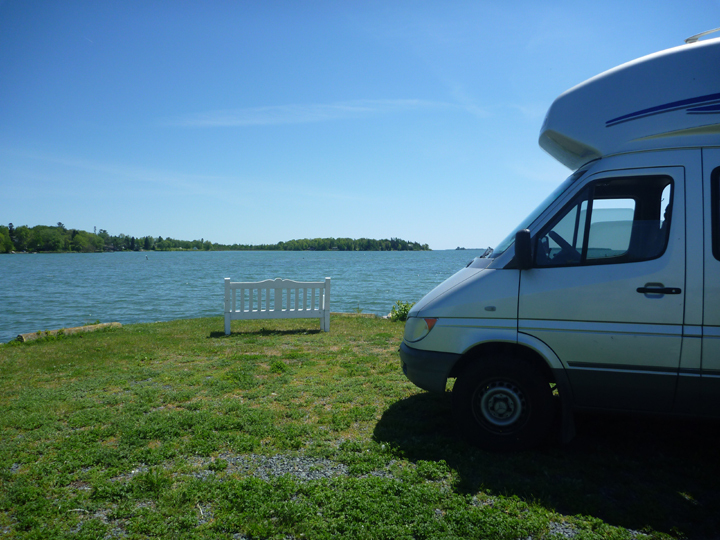 We’ve followed you since first discovering you in October 2013 along the Blue Ridge Parkway. We have really enjoyed our virtual tour and always looked forward to your next blog. As with all long trips, it is always nice coming home, but I think you will rest a bit and then get the “bug” again sooner than you think. As you’ve mentioned before, it is not the destination but the journey that beckons our souls. Thanks for sharing all your adventures with us! We just love your pictures! We are sad to hear you wont be posting much anytime soon but we will enjoy having a look through your older posts. Thanks for sharing!